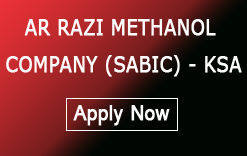 Urgent requirement for ICMS company for their upcoming projects for Ar-Razi Saudi Methanol Company. Since SABIC’s founding, its employees have exhibited a remarkable ability to do what others said couldn’t be done. Ranked among the world’s largest petrochemicals manufacturers, SABIC is a public company based in Riyadh, Saudi Arabia. 70% of the Company’s shares are owned by the Saudi Arabian government, with the remaining 30% publicly traded on the Saudi stock exchange. SABIC began in 1976 by Royal decree and its growth has been nothing short of miraculous. Today, the company has operations in over 50 countries with a global workforce of over 35,000 talented individuals. Work Location: KSA, Saudi Arabia is a desert country encompassing most of the Arabian Peninsula, with Red Sea and Persian (Arabian) Gulf coastlines. Known as the birthplace of Islam, it’s home to the religion’s 2 most sacred mosques: Masjid al-Haram, in Mecca, destination of the annual Hajj pilgrimage, and Medina’s Masjid an-Nabawi, burial site of the prophet Muhammad. Riyadh, the capital, is a skyscraper-filled metropolis. Required Minimum 6 years Experience in Maintenance Project of Petrochemical , Refinery, Oil & Gas Industry /GCC Experienced Must & Sabic Experienced Preferred. Interested candidates can send all documents & updated Resume along with relevant documents.